Tony Blair brushed all the questions about nostalgia at his final G-8 summit on Friday saying that his focus was on the job at hand. Three weeks later he will leave his Downing Street office for good. Two of Blair's main issues - climate change and aid to Africa - have been the focus of this summit, and he claims responsibility for first putting them on the international agenda, at Gleneagles, Scotland, in 2005, which he hosted. On Friday, leaders approved US$60 billion (EUR44.5 billion) to fight disease in Africa. And on Thursday, they agreed on a hard-won declaration on climate change that calls for a "substantial cut" in the greenhouse gas emissions blamed for global warming. "What I feel is that this situation is transformed from two years ago," Blair said of the climate change agreement. "Two years ago, we really put it on the international agenda. Now we have an agreement that there will be a climate change deal, it will involve everyone - including America and China - and it will mean a substantial cut in greenhouse gas emissions. "I think if you go back a few years ago, that would have seemed an impossible aspiration." While Blair refused to wax nostalgic about his last G-8, U.S. President George W. Bush - Blair's closest ally in the eight-nation bloc - felt no such reserve. After a bilateral meeting, the two leaders addressed reporters: Blair's statement focused on politics, while Bush began with a tribute to the British leader. "This is the last meeting I will have had with him as prime minister," Bush said. "It's a nostalgic moment for me. I'm sorry it's come to be, but that's what happens in life. We'll move on." Blair maintained his British reserve when he was asked if he, too, felt nostalgic about his last meeting with the U.S. president. "To be absolutely frank, at the moment I'm so into the difference between various linking systems of emissions trading that I haven't had time to feel nostalgic or anything else," Blair said. Before leaving Heiligendamm, Blair has one more item on his to-do list: talks with Russian President Vladimir Putin. Their conversation comes at a time when Russia's relations with the West - and with Britain - are at a low, and Blair's spokesman said the British leader would be frank with Putin. "Do we need to talk about issues such as Kosovo? Yes. Do we need to talk to Russia about issues such as Iran? Yes. Do we need to talk to Russia about issues such as energy supplies? 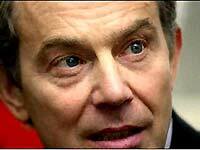 Yes," Blair's spokesman said. "Therefore, Russia remains - and will continue to remain - a very important player in the world," he said. "It is therefore right and proper we try to have good relations with Russia." Blair still has the European Union summit to attend before he leaves Downing Street at the end of the month, handing the proverbial keys - No. 10 has no lock - over to treasury chief Gordon Brown. But the British delegation at this summit is not fretting over June 27, their boss's final day at work. "These are - and I know it may be difficult for people to accept this - these are normal working days. We're getting on with the job," Blair's official spokesman said on condition of anonymity in line with government policy. "It is about getting on with the job and getting to the point we want. There may come a time for looking back, but this isn't it. This is about looking forward."